Running out of storage? Need somewhere to store your media files? Then, Its time to buy a External Hard drive now!! 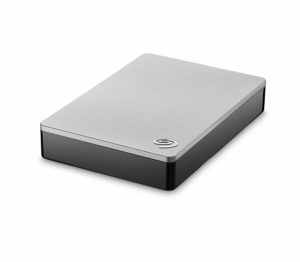 We’ll suggest you the best hard drives in the market. 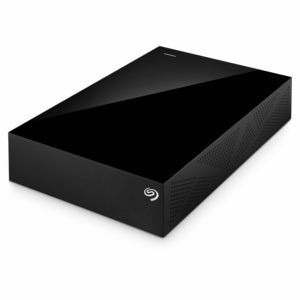 The Seagate Backup Plus is a large external storage device that comes with 2 TB, 3 TB, 4 TB, 5 TB, 6 TB and 8 TB versions are available of external memory. If you are running out of space on your laptop or computer, you can use this device to store all of your necessary files. You can connect the device with your laptops and computers to add to the pre-included internal storage. You can also plug the device in your television sets and home theatre systems and enjoy your favourite content directly. The included software suite allows social media users to get the most out their media libraries, uploading photos to Facebook or Flickr or videos to YouTube. It can also download photos and videos from those sites. Seagate Dashboard allows users to set up automatic backups when the drive is connected. The look is straightforward and standard for a single external drive storage device, slightly larger than a standard 3.5-inch internal hard drive. The chassis is made of plastic, but feels quite solid. There are ventilation holes on the side and bottom for easy air flow. This drive boasts a spindle speed of a 7,200 RPM, write speeds of 95.5 MBps and 127.0 MBps read speeds. Overall, the Seagate Backup Plus Desktop Drive is a great all-around option with simple functionality, easy setup, zippiness and a price point that makes it affordable to nearly everyone. My Passport is an inexpensive drive, but offers outstanding performance that rivals that of pricier competitors, thanks to a 3.0 USB port and excellent disk controller. This drive allows a maximum transfer speed of 174 MBps read, and 168 MBps write. 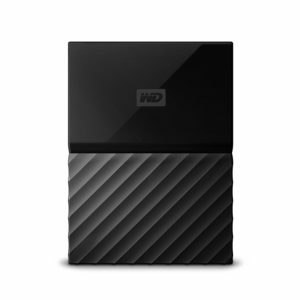 It’s available in sizes ranging from 1 TB to 4 TB. The features are tailored for simplicity. My Passport is pre-loaded with WD’s SmartWare software. It presents as two separate devices when plugged in – one drive with external storage space, and one drive with factory-loaded software. The visual interface is intuitive and built-in software allows for easy installation and management of setting. Backup and retrieval options allow you to set up incremental backups to be performed each time you connect the drive to your computer or device. Files inadvertently deleted from My Passport are easily retrieved, as are older versions of files. The drive offers password protection, and 256-bit data encryption. This 4TB external hard drive from Seagate is compatible with Apple Time Machine, making it the perfect external storage options for those in the Apple ecosystem. Just download the Seagate Dashboard software on your laptop and you can drag and drop any movies, photos, songs or other files. The device also has cloud connectivity and social media backup, which is great for YouTubers who have large files they want to backup or photographers with many pictures on Flickr. 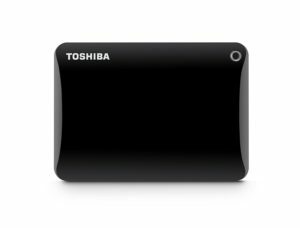 Slightly bigger than a deck of cards, the simply designed Toshiba’s Canvio Basics portable hard drive makes it easy to take all your files with you on the go. It comes in 500GB, 1TB, 2TB and 3TB models and works just by plugging it into your PC via its USB 3.0 port. (To use it with a Mac, you’ll have to reformat the drive to an OS X-compatible format. Don’t worry; it’s pretty easy to do.) It yields much faster transfer speeds than those that use USB 2.0 technology, but it’s still backwards compatible. It hits rotational speeds of up to 5400 RPM and features an internal shock sensor and ramp loading technology to keep your files safe. It’s portable for sure, but it’s also dependable and easy to use. 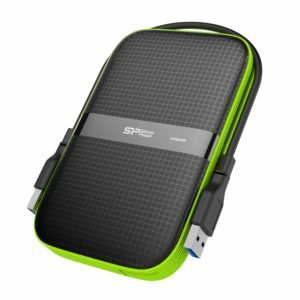 Try as you might, Silicon Power’s Armor A60 external hard drive is hard to dismantle. Not only is it water-resistant (IPX4) and drop-proof (up to 122 centimeters), but it’s scratch-proof, slip-proof and shock-proof, thanks to a textured casing with silicon material on the sides and edges. Its impressive read/write speeds are complemented by the use of USB 3.0 technology to deliver blazing fast transfer times. Compatible with both Macs and PCs, it comes with SP Widget, a software that simplifies data backup and restore, AES 256-bit encryption and cloud storage for efficient data management. Versions are available up to a whopping 5TB and it’s covered by a three-year warranty that promises complete service and technical support. 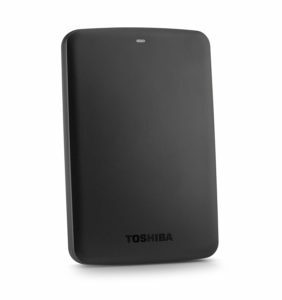 While Seagate and Western Digital get all the external hard drive glory, Toshiba’s Canvio Connect II 2TB portable drive is not too far behind. The Canvio measures just 4.3 x 3.1 x .08 inches and weighs just .5 pounds. Sizes range from 500GB to 3TB (just in case you need as much storage as possible), and it works with both Mac and Windows hardware. Setting up the drive is simple: there’s just one USB port for connection to the computer and for powering up. Read speeds on the 5400rpm drive are 98MB/s for small files and 103 MB/s for medium-sized files, while write speeds are 112 MB/s for small and medium files. Larger files read at 109 MB/s and write at 112.4 MB/s. Securing your backup is easy with password protection. And accessing your data on-the-go is offered via cloud backup with a bonus 10 gigabytes of online storage. The portable hard drive also comes with a two-year warranty. As a business owner, you’ll likely want a hard drive that has a large capacity and copies files quickly, not to mention one that doesn’t break the bank. 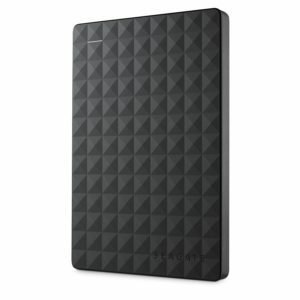 The Seagate Expansion Portable Hard Drive meets all those requirements and more. It comes in 1TB, 2TB, 3TB and 4TB models, and out of the box, it’s formatted to work with Windows computers. If you use Macs, don’t worry; you can reformat it in just a few seconds. In fact, buying a drive pre-formatted for Windows can be a much cheaper way to get storage for your Mac than buying a Mac-designated drive, which are usually pricier. Measuring 4.8 x 3.2 x .6 inches and weighing 6.4 ounces, it’s small and light enough to toss in your bag on the way to a business meeting. It houses a drive that spins at just 5,400 rotations per minute, as opposed to some faster 7,200rpm models, but it still delivers respectable performance: around 120MB/s for writing and 130MB/s for reading. On the up side, the slower speed also means it consumes less power. ← Send Self-Destructing 1GB Files For Free!